Rock n Roll San Antonio has been the last Rock n Roll Marathon Series event of the year since 2012. After the 15-race Hall of Fame medal was introduced in 2014, San Antonio became something of an end-of-year celebration among the folks who travel the country following the tour. In 2017, the popularity of the Global Tour Pass was at its peak, paving the way for more Hall of Famers than ever before. We landed mid-day Friday with plenty of time to hit the expo. This was the first one being organized by Ironman and there were some nice touches right out of the gate. The legacy website and stars at bib pick-up were a really nice tribute to the runners who’ve been here for all 10 years. Phil Buchanan finds his star. All through 2017, CGI had a couple of panels of a large banner that runners were able to sign. We finally got to see the completed work for the 20 Years Running celebration. THIS IS YOUR MOMENT. CONGRATULATIONS! This was the last chance for people to get that milestone 15th race for the Hall of Fame Heavy Medal. By last count, the Pannell Report had 74 people sitting at 14 races, making it likely that this would be the most Hall of Fame medals ever awarded at a single event. There were some hiccups at bib pickup, but we saw quite a few people sporting the 15 bibs and the new duffle bags. There was a lot going on Friday night, so Susan and I went over to Rosario’s for our traditional Friday meal for dinner. We caught a group of Black Sheep (Tony, Stéphanie, Josie, Andrea and Ali) and joined them for queso and fire roasted salsa. Definitely a must-have when in town for the weekend. Six of us hit Hall of Fame this year. Stéphanie was one of the few who ran all of the European Rock n Roll’s. The forecast for the Saturday was a bit warm but dry. Given the biblical flood we had in 2016, I was pretty happy. I took the first few miles at a faster pace, but decided to finish the last 4 chatting with Henry (aka, Barefoot Elvis). About the only thing we had to complain about was that they added the 5K option late in the year after we had registered for the 10K. Oh well. Same Remix medal and more steps. Saturday afternoon was busy. We had to go back to the expo to pick up our 16-race vanity bibs, but we weren’t in time to catch Mitchell Ginsburg’s Facebook Live interview with Ann on the occasion of his 100th Rock n Roll race. After that we hit the RNR booth for the Heavy Medal presentation where Aaron, Andrea, Leon and Sherry got plaques for running all 25 possible races in 2017 (including two same-weekend doubles and one same-DAY double). We made a quick change then headed down to the St. Anthony to see the tribute to Larry Macon’s 2000th marathon. I just read that last paragraph again. It’s absolutely crazy that we know all of these people! This year we did something different. Rather than have the usual, last-minute, disjointed, multi-venue dinner plans, Al and Amy put together a huge event at the Sheraton Gunther – by runners, for runners – for pre-race fueling and a tribute to the accomplishments for the year. Thanks to Drew and Kamika for pitching in on the set up and to Greg who jumped in to work the merchandise and raffle table. Ann, Ryan and Dorcas from the CGI staff made a surprise appearance. Ann gave a moving tribute to the people in the room who’ve made Rock n Roll even more of a family than before. Al was able to get a bunch of donations of running related items as door and raffle prizes including a few free race entries to Rock n Roll events for 2018. Amy presented Hyalker and his siblings with a special gift and a donation from the group to the Alzheimer’s foundation in memory of their father’s passing. “H” has been one of the most giving, generous people we’ve met on the Series. It was great to be able to give back when he needed it. I gave a quick pre-race update for the Pannell report. Odds are good that we crushed last year’s total of 151 Hall of Fame medals. Amy and Ainsley closed the nights presentations with a tribute to Mitch’s 100th Rock n Roll. We had just under 100 attendees and a surprise appearance from a few of our favorite CGI staffers. The event exceeded just about everyone’s expectations and I have to say, we clean up well! Al is already looking for a venue for a mid-year reunion at Rock n Roll Chicago in July. Just like Greg’s 100th in Chicago, Ainsley organized a shirt printing for Mitchell. The theme this time around was a nickname he earned while traveling with Greg and Amy. The big reveal took place at gear check along with a champagne toast. One last starting line. One last Rock n Roll for the year. We have no races for 6 weeks, so I took a look around a little more than usual. Take it slow. Stop and chat. Hang with a bunch of Hall of Famers (and a few repeaters). Remember to stop for the right pictures. Pet all the dogs. Fist-pump for Rock n Roll Jesus. Brush off the downpour. It’ll stop soon and you’ll dry off. Just watch your step. Stop for one of the best race entertainment of the day – a traditional Mexican dance on the bridge above. We didn’t catch Larry Macon before the split at 12.5, but we did run into Phil and Sherry before they headed off for the second half of the marathon. The half ended with hugs and bling. Lots of bling. I got back out to see Mitchell finish the marathon. With a lot of people already waiting for him after finishing the half, I think this was the biggest finish line Century Club celebration so far. Mitchell is the 10th runner to hit that lifetime mark. 2017 was a good year in a lot of ways. Since I’ve dragged my feet in publishing this recap, I’ll just do our annual review in a paragraph here. We ended our year with 23 Rock n Roll races – 15 half marathons, one full (including our 100th Rock n Roll race in San Jose) and 7 Remix races. The full in Chengdu was our 7th Continent, completing a goal that started at the Mayor’s Marathon in Anchorage, Alaska 12 1/2 years ago. We’ve applied for membership and certification in the Seven Continents Club and should be official once the Chengdu results are posted. We did only one other race this year, the 4th (and possibly last) Disney Superhero half on the front end of the double day in November. There weren’t any PRs this year, but we spent a lot of miles chatting about past races, future milestones and everything that goes on outside the start and finish lines. 2017 was a lot about solidifying old friendships and getting to know new ones. This year, more than most, felt a lot more like a graduation than previous years. We’ll look forward to seeing everyone at the class reunion in Chicago. With the ownership of the series transitioning to Ironman from Competitor Group, the Tourpass pricing structure changed. No longer are we allowed to register for any race for the year (including the Remix) for one fixed price. The new Tourpass was now limited to 10 events, regardless of distance, at a price 20% higher than 2016. Early reaction wasn’t great, but it remains to be seen how the numbers play out next year. There was a long line of people waiting for the Winter sale on December 14th and I suspect there will be more for the Summer event. If it turns out that the pricing drives people to find other races, we’ll be thankful for sharing the time we did. The San Antonio results, as of New Year’s Day, are posted, but times are listed as NULL. 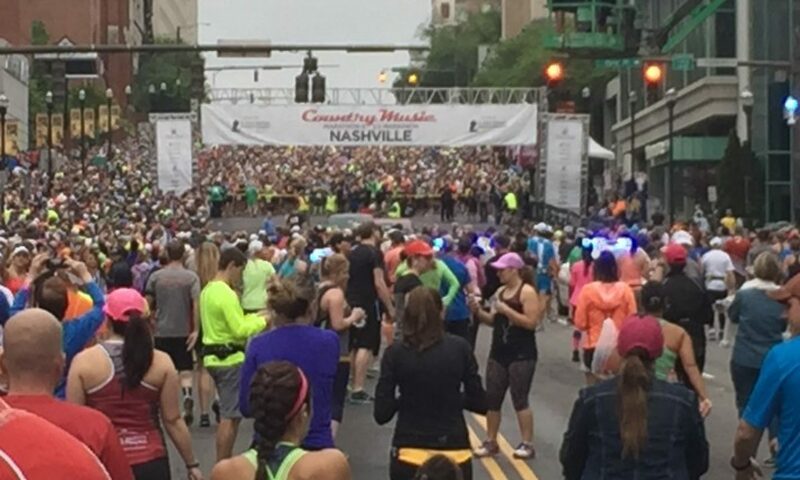 The results site lists 13,374 finisher (10,465 in the half, 2,909 for the marathon). The location looks safe for another year. We’re starting to see the medals, shirts and signs of a different ‘runner experience’ through the RNR email lists. I guess we’ll see how things look in a couple of weeks as we start all over again in Rock n Roll Arizona. There will be 3 (maybe 4) more entrants to the Rock n Roll Century Club in 2018. Beth and Jim are targeting home-town race Raleigh and Los Angeles will be Mr. Aguilar’s Juan-hundredth. Depending on where Deb ends up, she could be at the 100 mark late in fall or early 2019. My records show Amy, Jessica and Hyalker sitting in the low 70’s but records get decidely sketchy after that. If you’re reading this and know that you’re at 60 or more lifetime Rock n Roll half or full marathons, please drop me a note. I’d like to get you on our list!